About 7 or 8 months ago, I made myself a new dovetail saw. I liked my old dovetail saw OK, but I wanted a bit more finesse, especially for really thin stock. I also wasn’t crazy about the handle on that old saw. While I had gotten used to it after years of use, the grip was a bit thin and the hang angle was a bit steep for how I like to cut dovetails. After selling my old dovetail and carcass saws, I could wait no longer to build a replacement. My old dovetail and carcass saws. 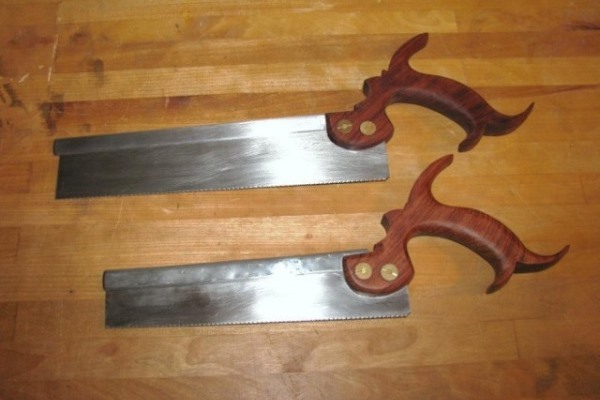 These were the first two saws that I ever made, back in 2008. However the first replacement didn’t turn out exactly like I had planned either. I had wanted a traditional folded brass back. So I ordered one from my friends at TGIAG Toolworks. It was beautifully done and folded perfectly. The problem was, it wasn’t closed tightly enough for the super thin saw blade I was making. You see, most dovetail saw blades run around 0.020″ thick, and the brass back I received would have been perfect for such a blade. But I was making a blade that was a mere 0.015″ thick, and the slot in the folded back was just too wide. I tried closing it up, but it just wouldn’t go tight enough without resorting to heavy hammer blows. This would have left the back with lots of hammer marks that would have required a lot of filing to remove. I just didn’t want to ruin such a nice brass back in that way. So I left it barely pinching the super thin blade and relied on a bit of super glue to keep it from rattling in the back. I used the saw for several months, but the loose back finally got to me and I decided to replace it. Having no other reasonable options for a folded brass back, I bit the bullet and decided to go milled. 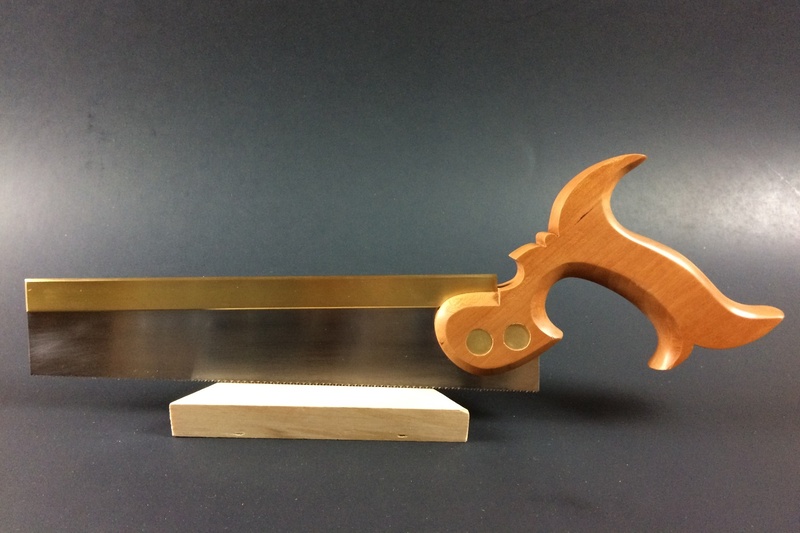 So I ordered a milled brass back from Blackburn Tools, and remade the saw. In the end, I have no regrets doing so. The milled slot was a perfect match for the 0.015″ thick blade and holds the blade rigid and perfectly straight with just a wee bit of 30 minute epoxy. Of course since I changed the back, the handle was not quite the right fit to the milled back now. So I remade the handle as well. This one is in cherry to match my large rip and crosscut saws. Brass split nuts from TGIAG complete the package. So without further ado, the new BRFW dovetail saw. The new BRFW dovetail saw. The handle is made from cherry. The blade is 10″ long and only 0.015″ thick, with 17 PPI, making for very fine, precise cuts. The handle on this saw is a bit heavier than my old dovetail saw, in both the width and thickness. The hang angle is also a bit lower. 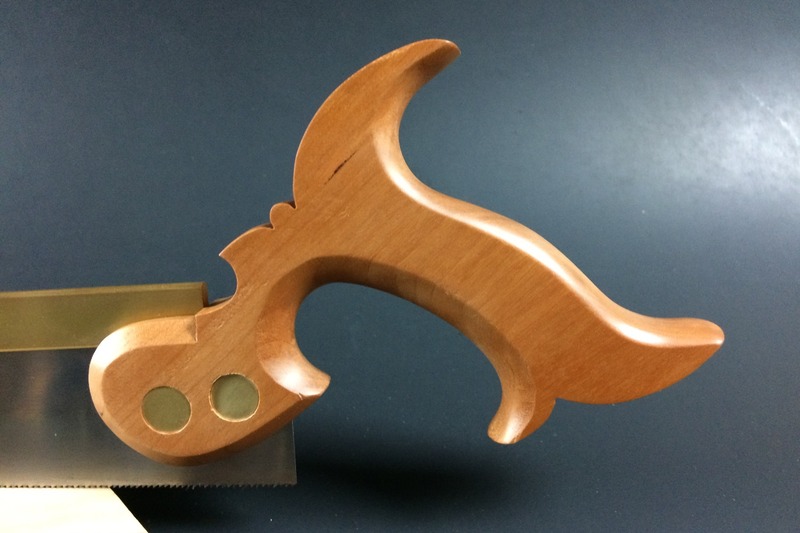 In use, I have found this saw more comfortable and a more natural fit to how I saw dovetails. Posted in Hand Saws, Toolmaking, Tools and tagged dovetail saw. I have followed your saw making since the very beginning and I continue to be awed. Congratulations on your new saw! Hi Bob, Just found your new site; congrats on the saw…looks like a beaut and I can just hear the smooth cutting sound.